It is important to realise that independent research into the effects of lighting on dairy cattle has been carried out since 1978. It has shown that the correct light intensity and duration have a very positive effect on the health, fertility, welfare and productivity of dairy cattle. Probably the best known phenomenon of light is that it controls hormone levels in dairy cattle and therefore has a positive impact on milk yield, which can increase by 15%. It is probably less well known that correct, uniform lighting in livestock housing improves fertility and has a positive influence on oestrus, and also makes it easier to spot. The calving interval can also be reduced by using the correct lighting regime and light levels. Signs of disease can also be detected at an earlier stage. In other words: the correct lighting will ensure that livestock are healthy and active. 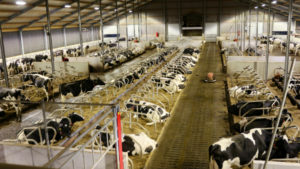 Dairy cattle cannot distinguish between high pressure sodium and metal halide, so only the intensity and duration of the light are important. Research has shown that the minimum light level should be 150 lux. 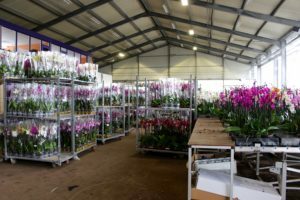 A lighting regime of 16 hours of light at a minimum of 150 lux, followed by 8 hours of darkness (maximum 5 lux) will produce the positive benefits mentioned above. Using the lighting to increase the day length affects melatonin production. Melatonin is also known as the sleep hormone. Light inhibits melatonin production and darkness accelerates it. In other words, longer periods of light mean less sleep hormone and healthier, more active cows. 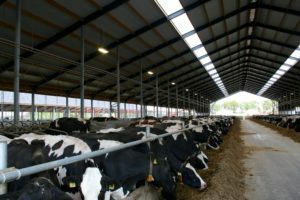 The lighting regime described above simulates long summer days, the days when the cow is naturally most active, resulting in higher yields and higher feed intake.